One way to explain Nechville’s dramatic redesign of the banjo is to think of parts of the banjo as either serving a primarily mechanical/structural purpose or a tone-creation purpose. Certainly the rigidity of the construction will affect the sound, so different woods and materials within the structure can affect tone. But for this explanation we will think of the neck, coordinator rods, flange, hooks, nuts, and tension hoop and tailpiece as serving primarily a mechanical/structural purpose. 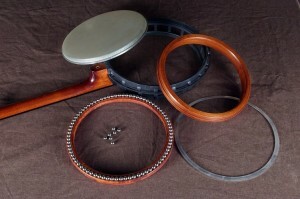 The tone ring and rim in a Mastertone pot also serves as a primary structural member being firmly bolted to the neck yet it is also supposed to define the tone parameters of the instrument. The strings, bridge, head and resonator serve strictly acoustic purposes. The Nechville design distinctly separates the structural members from the tonal members, allowing the tone ring and rim to enter fully into the tone component category. Since the Heli-Mount to neck connection rigidly provides the structural requirement to carry the string tension, the tone ring and rim are freed from their structural job and can be designed for purely acoustical purposes. This new way of building a banjo almost turns the instrument inside out, allowing the tonal possibilities of the tone ring and rim to be more resonant and contributive to the overall sound. Helical mounting of the tone chamber (head, tone ring and rim) isolates it from neck and hardware stresses and resulting resonances from structural metal parts. Helical mounting opens new avenues of sound exploration for musicians as alternatives to the heavy traditional banjo design are being discovered. Stay tuned to www.nechville.com for the latest in banjo making history.